I have been thinking about lighting kit for the ’28 Model 90 and came across this original Lucas document on the usual auction site. 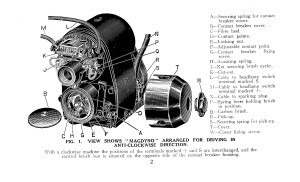 The title is : Running Instructions For The Lucas “MDB” Magdyno Lighting And Ignition Set for Motor-Cycles 1929 Equipment. So, I scanned it and posted it here in case anyone else is interested. I think I need a Lucas SS49 headlight or headlamp to be correct for the year, there are some very nice replicas available from Vintage Replica if I fail to turn a genuine one up at sensible money. This entry was posted in General and tagged Lucas, Rudge, Sunbeam by Dodson. Bookmark the permalink. Very useful. Do you have any information on the specification for the Dynamo bearings? I’m glad you find the information useful but, sorry, I don’t have any additional information about the bearings. My MDB 1 magneto was overhauled by DH Day in Wiltshire who may be able to advise? Hello from Paris. Many thanks for posting the Magdyno Lucas MDB owner’s manual. The document indicates and illustrates a “half-charge resistance”, spare part n° S464. Do you known its value in Ohm? Or somewhere to find it? Good question and I’m afraid I don’t know the answer. I just measured a resistor in an old H52 style headlamp at 7.5ohms but that’s a later design of lamp than would have been used with an MDB. Please post again if you find the correct value?